Sustainably manufactured, comfortable underfoot, and quite visually striking, cork flooring is no newcomer, but its rise to popularity has been a recent phenomenon. Cork flooring has been in the news recently, but cork is anything but new. It’s been marketed as a flooring material for about a hundred years; Frank Lloyd Wright even used it in his 1939 masterpiece Fallingwater. Cork flooring is made from the bark of the cork oak. The bark can be harvested every nine years or so without causing any harm to the tree, which makes cork about as sustainable as a building material can get. 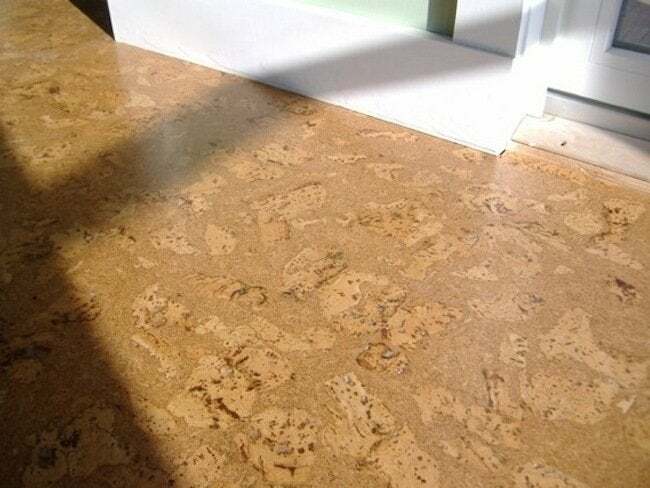 Cork flooring is made from material left over from the manufacture of bottle-stoppers. The waste is ground into granules, mixed with resins, molded, and baked. The resulting product is usually sold either as solid cork tiles or as laminate planks—tongue-and-groove fiberboard topped with a cork layer. Cork is springy and warm underfoot, it’s resilient, and it’s a great insulator. Cork can, however, be scratched and gouged. Dirt and grit need to be vacuumed regularly, and cork floors probably shouldn’t be subjected to guests with stiletto heels. Cork can fade with too much exposure to the sun, and it’s sensitive to heat and moisture. Long available in a range of brown tones, cork is now offered in a greater variety of colors and patterns, making this floor covering more versatile than ever. With so much going on underfoot, maybe it’s time to give cork a look.